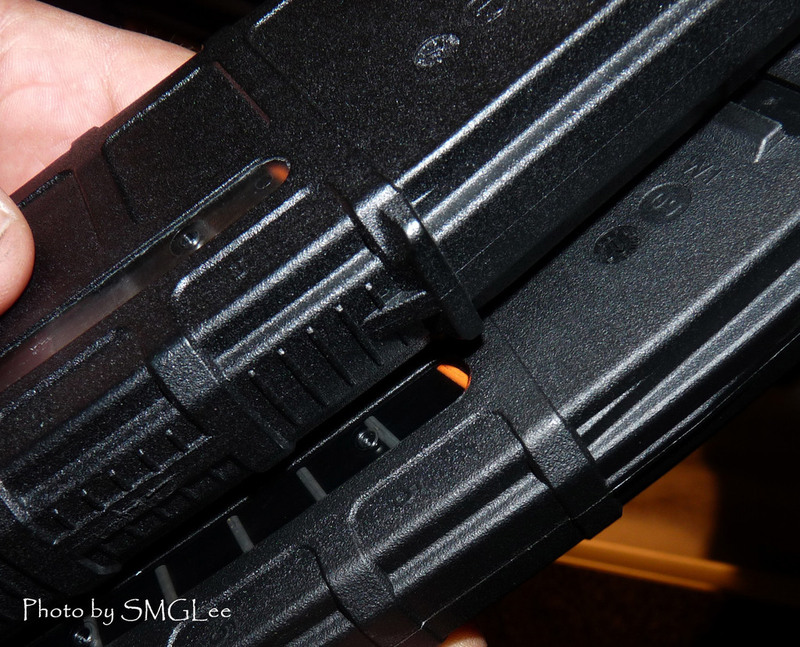 M3 Magazine: The Magpul M3 is a stronger and redesigned PMAG. It offers a completely newly-designed floorplate which is slimmer than the PMAG and slides off from the front of the magazine, allowing for easier magazine take-down. The magazine is one of the first Magpul products to be made of a new polymer formulation many times stronger than the current PMAGs. The spines have new grip surfaces on the front and rear of the mags and a dot matrix which will allow for easier marking of mags (you should always mark your mags so someone doesn't pick them up on the range!) Lastly, a new amber-colored follower which hopes to allows easier magazine insertion under a closed bolt and more protection against magazine damage under full spring tension. The 5.56 M3 magazine will be the first Magpul product to use these new technologies with plans to extend to other calibers and products. Expect pricing to be similar to PMAGs. The first run of the M3 will likely come in 30 round capacity and windowed and non-windowed versions. XTM Handstop: The XTM handstop is a new slim alternative to the AFG for shooters who want a little extra grip on the end of their rail/handguard without a lot of extra bulk. It utilizes a couple of XTM rail panels and two small handstops which are approximately 90 degrees. One or either of the handstops can be attached to any rail section for a variety of gripping options. The larger of the two handstops can be torqued down onto the rail via the typical Magpul Hex-screw. The smaller handstop essentially functions just like an XTM panel and snaps onto the rail. The XTM rail panels that come with the Handstop kit are the new textured XTM rail covers, which offer better grip and the rail attachments offer a more secure attachment to the rail. This is a really awesome, affordable entry into the handstop market, as current competitors handstops all approach $50. Expect the XTM handstop kit to be available for around $20. MagLink: The Magpul MagLink allows you to couple two PMAGS together for speedy reloads, as you only need to lower the empty mag out of the magwell and shift to the 2nd full magazine. Shooters will recognize this technique from the Magpul Dynamics videos. The amount of time you save reloading is impressive. There is some learning curve however, as you do have a slightly bulkier rifle and some added weight, as well as obscuring the bolt-catch paddle. Use of a Magpul BAD Lever would be advised if using the MagLink. This item is currently available from many distributers for around $20. Overall, these are really exciting products from Magpul. The guys at Magpul Industries continue to push the envelope for the AR-15 rifle and bring us products which make shooting the weapon easier and more efficient. Stay tuned for release dates on the yet-to-be-released M3 magazines and XTM handstop, and as always keep an eye on StrongsideTactical.com to get these products as soon as they hit the shelf. If I can get my hands on a few of these, expect close-up reviews and range reports!